These EZ Entry Aids are a beefed up version of our popular Super Mounts and include grips for grabbing. They make getting on and off of your trike a much easier task. A great upgrade if you want to avoid slippage. The SRAM grips are sure to keep your hands on the handlebars. We make these beauties here in our shop. Many of our trikes sit so low to the ground that they are hard to get into. 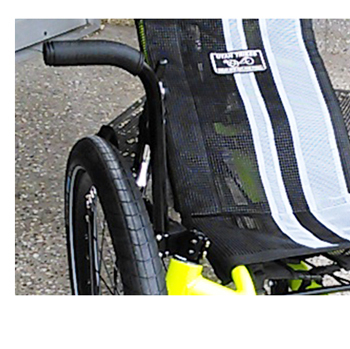 The Entry Aids make getting down into your trike, or back out again a breeze. Compatible with KMX and Catrike models, these are a must have for any triker. "26 inch back wheel "